मिलावटी तत्व : Melachite ग्रीन - जिसका प्रयोग कपड़ो और कागज को रंगने के लिए किया जाता है. 1. There are recent concerns over the presence of the potential carcinogenic chemical malachite green (MG) in eels, processed eel products and freshwater fish. This brief gives an account of this substance and the risk to public health in light of available scientific information and the recent food surveillance findings. 1. Malachite green (MG) is a synthetic dye used to colour different materials such as silk, wool, cotton and paper. 2. MG has been used commonly worldwide in aquaculture as early as the 1930s and is considered by many in the food industry as an effective antifungal agent. It has been used for the treatment of parasitic, fungal and protozoan diseases in fish. 3. When fish is treated with MG, this substance will be absorbed and metabolised in tissues of fish. It has been reported that one of its major metabolites, namely, leucomalachite green (LMG), would persist in fish tissues for a long period of time. 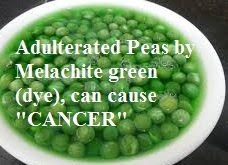 1. International food safety authorities such as the Joint FAO/WHO Expert Committee on Food Additives (JECFA) and the International Agency for Research on Cancer (IARC) have not evaluated the safety of MG.
2. In some research studies in experimental animals, MG was found to be toxic to the liver, cause anaemia and abnormalities in the thyroid, and affect the foetal development of the experimental animals. 3. Animal studies also found that MG may cause liver tumours in mice. However, there is yet no evidence of carcinogenicity for MG in humans. 4. As for genotoxicity (ability to cause damage to genes), there are conflicting evidences in the international scientific community on whether MG and LMG cause gene mutation or damage to the gene. 5. Due to its ability to cause cancer in experimental animals, it is not appropriate to use MG in food fish. Given the toxicological information available, extensive abuse of MG in aquaculture may result in excessive exposure to MG by the consumers resulting in adverse health consequences. 6. However, in light of the recent findings on the levels of MG found in freshwater fish available locally, exposure to such levels of MG is unlikely to cause significant adverse health consequences to the consumers. It has been estimated, using international standard risk assessment methods inferred to humans based on results of animal studies, that significant adverse health effects due to MG are not expected even when a person consumes up to 290 kg of freshwater fish each day. For eels, which were found to contain relatively higher levels of MG, significant adverse health effects due to MG are not expected when a person consumes up to 7 kg of eels a day. 1. Codex has not established food safety standards for MG in food. 2. The US, the EU (including the UK), Canada, Japan, Thailand, Singapore and the Mainland do not permit the use of MG as a veterinary drug on food animals, aquaculture or fish for human consumption. 3. In Hong Kong, MG has been included in the Harmful Substances in Food Regulations to prohibit the presence of MG in all food sold in Hong Kong. This legislative amendment makes it an offence to import or sell for human consumption any food containing MG. Offenders will be prosecuted and upon conviction will be liable to a fine of $50,000 and to imprisonment for 6 months. 1. Do not use MG on food fish from culture to retail levels. Operate all food fish-related businesses under good agriculture practices. 2. Buy fish from reputable suppliers or importers. Avoid buying fish from dubious sources. In case of doubt, ask for and check documents and certificates accompanying the consignment to ensure the supply is MG free. 1. In the light of the available scientific information and levels of MG detected in freshwater fish and eels recently, risk of significant adverse health effects of MG due to consumption of freshwater fish or eels is considered remote. 2. Buy food fish from reputable sources. Do not patronise illegal hawkers selling food fish and their products. 3. Maintain a balanced diet with a variety of food.